The multiple award winning Governor of Enugu State, Rt. Hon. 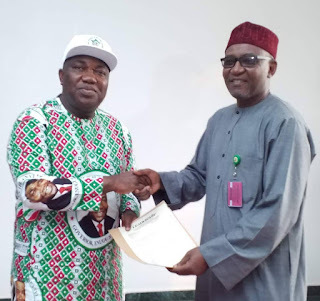 Ifeanyi Ugwuanyi received letter of notification as the Leadership Governor of the Year 2018 from the Group Managing Director (GMD) of Leadership Newspapers, Abdul Gombe, at the Government House, Enugu. The award will be conferred on the people's governor on Thursday, February 7, 2019 at Abuja International Conference Centre, in recognition of his "relentless disposition towards building national cohesion, coupled with your strides in engendering industrial harmony, innovative and creative IGR process, internal security and massive infrastructural development in Enugu State". Recently, The Sun, Vanguard and Independent Newspapers also honoured Governor Ugwuanyi as their Governor of the Year 2018 in recognition of his sterling performance.